God of War (2018) is the latest game in the God of War series and the newest game in Kratos adventure. It’s a soft reboot to the franchise and changes a lot of gameplay mechanics. This is not the God of War you know. And that’s a good thing. The developers at Sony Santa Monica took a risk with this game, and it paid off. They could have made another hack and slash God of War game similar to III, but they decided to spice things up, and it worked out for the best. I’ve had the game since launch, but I wanted to wait until I was fully confident to review this game and now is the time. God of War is a stunning, ambitious and top of the class game and is just a technical marvel overall. The amount of detail to the overworld and the character models is honestly just breathtaking. While playing this game I was utterly engrossed by everything, my eyes were wide, and my jaw was always dropping. I haven’t seen a game with such detail since Horizon Zero Dawn, and even that game didn’t have the best facial animations. I’m usually picky with visuals in video games but even when I tried to find some sort of flaw, I just couldn’t. The visuals and technical work in this game are unmatched, and the team over at Santa Monica Studio really set the bar really high. I was especially impressed with Kratos’s character model. I compared the character model in this game to God of War III, and the number of improvements was just incredible. Of course, this is a current generation game while God of War III is the last generation game, but comparing the two and seeing the improvements was great and it showed me just how much technology has advanced since then. The opening scene in God of War was advanced yet straightforward. When I first pressed the X button the game went straight from the menu into the game with no loading screens and with no camera cuts. It’s rare and almost unheard of to see a game with no camera cuts, but God of War does just that. The no camera cuts don’t only happen during the start of the game but it happens throughout the entire game. So you can’t skip cutscenes, or pause or do any of that because the game goes straight into a cutscene and transitions smoothly into gameplay, the cutscenes in God of War are part of the gameplay, and that’s what makes this game truly impressive and innovative. God of War shows us that technology has improved so much within these last few years and will only continue to improve. The soundtrack in God of War is fantastic, rivalling soundtracks from other critically acclaimed games like Shadow of the Colossus. Some of the instrumental pieces in this game are beautiful and really help to create impactful and emotional moments throughout the game. The track “ashes” that plays at the beginning of the game is powerful. It helps set the tone. Ashes is a powerful piece of music because it set’s the way for the game, this track tells us that the story in this game will be emotional, impactful and compelling and that’s why I appreciate it. One thing I can say with confidence is this game was a change for the better. The gameplay is better, the characters are better, and the plot is better, and the music is better. The gameplay in this game is very different compared to past God of War games. In other God of War games, you started off with the Blades of Chaos. Kratos’s iconic weapon. In this game you start off with a new weapon. The Leviathan Axe. The Leviathan Axe is a neat weapon. You can throw it to smash it into enemies and sometimes freezing them. Throwing the Leviathan Axe can be incredibly satisfying. The combat system in this game is fulfilling. You can dodge, evade and do many different combos. The game still retains its hack and slash nature but this new refined combat system has more depth than any of the combat systems in past God of War games. Atreus can also help you in battles, pressing the square button allows Atreus to fire his arrows. As you play the game, you will unlock different arrows for Atreus and eventually special moves. You can upgrade your weapon and your armour in this game. Some RPG elements are sprinkled in this game which is nice. Eventually, you’ll get the Blades of Chaos back, and you’ll be able to switch between the Leviathan Axe and the Blades of Chaos. The Blades of Chaos is entirely different to the Leviathan Axe, and if you enjoyed using the Blades of Chaos in the past games, then you’ll enjoy it in this game too as the Blades are just as fast paced as they were in the previous games. Boss fights in this game can be thrilling, and even the mini-bosses can be a lot of fun. The first fight against “the stranger” was unbelievably good. It was a raw, brutal and a bloody battle and was just enjoyable. It got me excited to play more and more. God of War is filled with optional bosses as well, so there is lot’s to do in this game. God of War tells a beautiful story and focuses on the relationship between Kratos and his son Atreus. Both of them venture into the wild to spread their beloved ashes. They encounter multiple enemies, turn friends into enemies and meet allies along the way. The character development in this game was terrific. 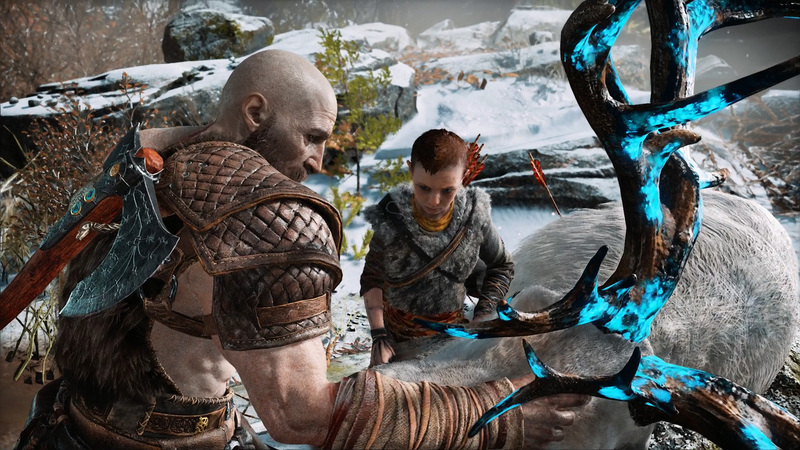 I felt like Kratos’s character didn’t change too drastically throughout the story, but I thought he had a tighter connection with Atreus by the end of it. Atreus character did change a lot. He went from being a meek, shy boy to being a selfish youngster once he learned something important about his life, he later changed again, and this new personality, near the end of the game, was a fusion with his character from the beginning and the mid-game. Atreus was mature and a powerful fighter by the end of it all. God of War is definitely a Game of the Year Contender. I can’t call it Game of The Year yet since there is still more to come, but it is definitely the best game release so far. It’s a brilliant game, and I think everyone who owns and doesn’t own a PS4 should play it. It’s not one to be missed. God of War is a masterpiece. It's bold, ambitious and powerful. God of War is not only a Game of the Year Contender but a game that will stand among other classics as some of the best games ever made.